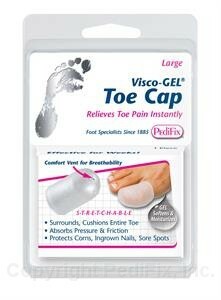 Surround toes with soft Gel protection. Thin side wall design takes up less space in shoes, ‘Comfort Vent’ for breathability, extra padding for toe-tip protection. Relieves pain from corns, ‘hammer’ and crooked toes, ingrown nails, more. 1 per pack.